To be honest, the first time I heard the words "STEM Lab" I had to go and google search to find out what it meant. My teaching job is STEM Lab Teacher. 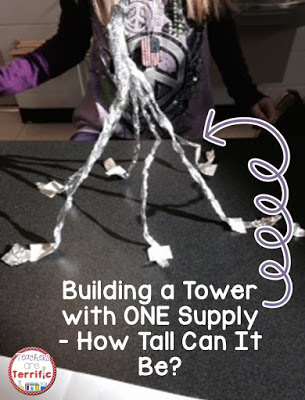 Join me in this four part series to learn more about STEM and why you just might need to make it part of your classroom! Today's topic is STEM supplies! It's a rather daunting aspect of STEM and I do sometimes look at projects and know the cost will be prohibitive. Even if I were teaching a self-contained class and only needed supplies for 20-30 students it can still be overwhelming! By the way I have 17 classes that I see each week! I am telling you that supplies can be dollar store items or just the junk you pull out of the cabinets. straws, aluminum foil, craft sticks, masking tape, string, paper, foam pieces, toothpicks, modeling dough, pipe cleaners, cotton balls, and pennies. Let me show you a few things we have done and the simple supplies used. Students use spaghetti, masking tape, string, and one marshmallow. I buy the largest box of generic brand spaghetti Wal Mart has, masking tape from Wal Mart that is 97 cents a roll, one bag of jumbo MM's (also the generic brand), and the roll of string I have had for a long time. Total cost for one class would be less than $5. You could buy a smaller box of spaghetti for only one class! 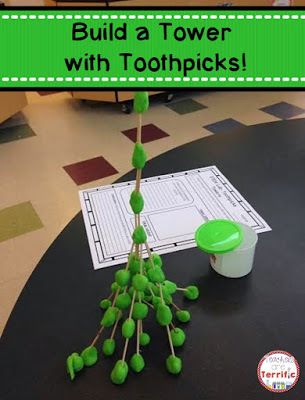 For this one you need TWO supplies- toothpicks and cans of modeling dough. The toothpicks I seem to have on hand already. But a box from the WM is less than $1 and the modeling dough is found at The Dollar Tree. It comes in sets of four cans for $1 and I get enough so every group has one can. So, total for this challenge is $6-$7 per class. Kids love this challenge! Y'all I am not kidding. Every group of students I have used the Boat Challenge with has LOVED it and they want to repeat it a lot! The "junk" I use for boats is straws, styrofoam cups, plastic wrap, aluminum foil, tape, and foam sheets. All of those supplies come from the Dollar Tree. In fact, just a small secret I will tell you: ALWAYS buy straws at the Dollar Tree. They are longer than the Wal Mart brand. Total cost for a class would be about $6 and you will have supplies left over. You also need dish pans! And you need pennies to use for weights! Two supplies: foil and tape. Yes, I know aluminum foil costs a lot, but I found this spectacular thing at The Dollar Tree! Aluminum foil Sheets! Yes, sheets. They come in a pack of 30 and it's sheets that are about 12 inches or so square and they are already torn. It's not great quality foil, but it works perfectly. Total cost for a class would be about $2! 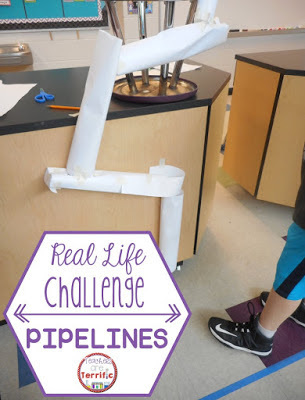 This is THE MOST Spectacular challenge and it uses two things- paper and tape. I mean copy paper- something you already have tons of and if you do STEM challenges at all you will have masking tape! Total cost for a class would be about $1- if you had to buy tape. I promise, cross my heart, the day I invented the Boat Challenge I literally just started opening cabinets and dumping out weird things I found. When the kids came in I said, "Here you go! 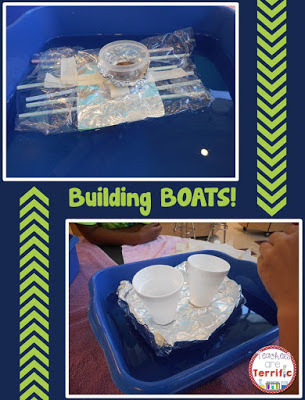 Build a boat!" They loved it! They had no clue it was just junk from the cabinets! Yes, supplies can be more costly and harder to obtain. But you can also just visit the Dollar Store! Get parents involved. Send home a newsletter and ask for supplies. Be specific. Tell parents you want the aluminum foil sheets from the dollar store or the straws or cans of modeling dough. Ask for donations if parents don't want to go shopping! Get your PTA involved and always ask your principal for help with getting things. This year I got enough microscopes for a class set just by mentioning it to my boss one day! Come back next week and read about more reasons to try STEM. It's all about Collaboration! The first time I heard STEM I was soooo intimidated! After using some of your challenges in my own classroom, I was BLOWN away by how simple it can be to implement for the teacher. On the students end, I found how much more they knew and could problem solve than I ever gave them credit for. I am a STEM believer for sure now! Thanks Alison! I looked for the email for this comment so I could reply that way, but it is lost in cyberworld forever. Doing NOTHING for a week of vacation turned my brain into a puddle. But it sure was fun! Summer STEM Series- Part 4- Problem Solving!